The latest Sunday Times Behaviour & Attitudes poll puts the party in second place behind Fianna Fáil. Sinn Féin is now the second most popular party in the country. 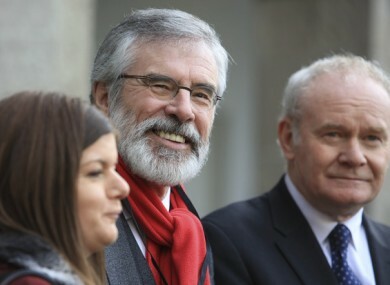 SINN FÉIN IS now the second most popular party in the country, according to the latest opinion poll. The Sunday Times Behaviour & Attitudes survey puts Sinn Féin ahead of Fine Gael for the first time. The party jumped four points to an approval rating of 23%, its highest result since the B&A Sunday Times series began in 2011. The number puts the party one point ahead of Government party Fine Gael, who rose one point to 22% in the poll. Meanwhile, the Independent Alliance grouping also rose one point to 6%. Fianna Fáil is still well ahead as the most popular party in the country with 28%, however it did drop four points in this survey. The survey was conducted over nine days up until Wednesday. Debate over the future of water charges, the terms of reference of the Grace foster home investigation, and the remains of babies being found in Tuam were all the dominant political stories during this period. Email “Sinn Féin is more popular than Fine Gael in the latest poll”. Feedback on “Sinn Féin is more popular than Fine Gael in the latest poll”.